Growth Engine clients have access to their Performance Analytics & Customer Relationship Management (CRM) system through our dashboard. You will track your results, campaigns, leads and grow your audience! A Customer Relationship Management system is web-based platform where you can view, track and follow-up with leads and contacts. A CRM will track all the ways you interact with each contact, including through multiple campaigns or marketing channels like email and Facebook. Your CRM is built into the Growth Engine platform. Options are dependent on your subscription level. 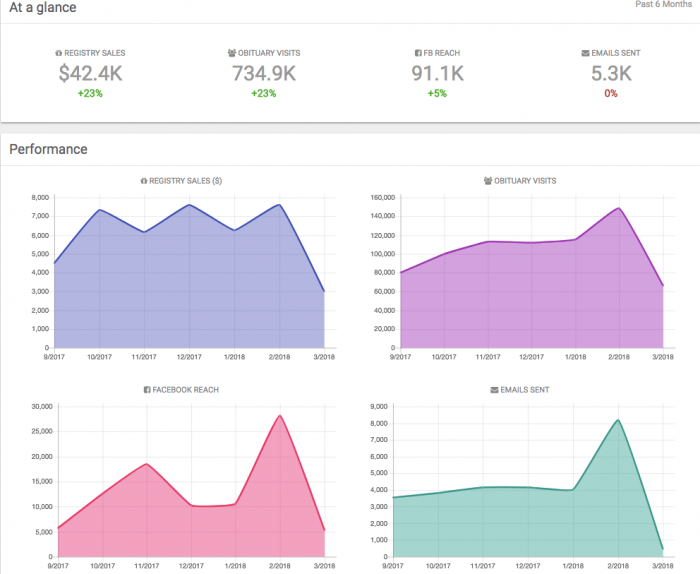 Performance Analytics detail how your Growth Engine Marketing efforts are doing. Details include your Facebook reach, Gift/Floral/Healing Registry sales, emails you have sent, and obituary views. Performance Analytics are part of your Growth Engine platform. Options are dependent on your subscription level. Why do we need a CRM and Analytics? Measuring your return on investment (ROI) is a critical part of an effective marketing strategy. Managing your customers’ interests, and following up when they ask, allows you to provide better service to your community and increase your sales conversions. By reviewing, and optimizing your strategy based on results, we are able to increase your community reach and effectiveness. What other features will I find in my Dashboard? Dependent on your subscription level, you will find tools to view, and edit your Facebook, email and newsletter strategy including frequency and your preferred content. 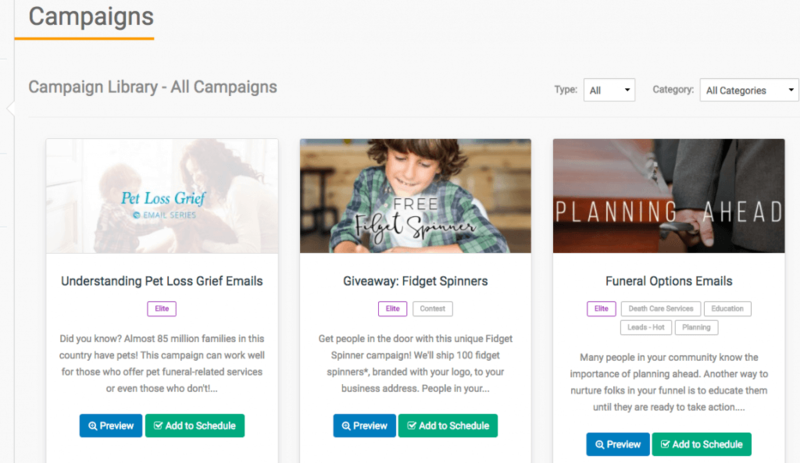 You can schedule and manage your campaigns and event promotions. You will be able to manage and view all of your contacts (not just your leads). You can manage your settings to collect reviews and promote the ones you prefer on your website and on Facebook. And, it’s all right there in one place! You can use the platform as much or as little as you prefer! We can handle it all. It’s just that easy. Ready to launch your marketing strategy and be in complete control of your results?